Libyan militia commander Gen. Khalifa Hifter meets with Russian Foreign Minister Sergei Lavrov in Moscow, Russia, Aug. 14, 2017. With Khalifa Haftar’s forces stalled outside the capital, Tripoli, the eight-year omnishambles in Libya is approaching a climax. It’s not clear yet which side is going to win, but at least the dozens of rival militias in the country are now lined up in two recognizable sides. Haftar does have the gift of bringing clarity to a situation. Alas, he achieves this mainly by making so many Libyans hate him. To them, he is Gaddafi 2.0, a would-be military dictator who aspires to be a Libyan counterpart to Egypt’s General al-Sisi — and is generously backed by the Egyptian dictator. That’s not what they fought the 2011 revolution for. Of course, the militias didn’t really do the heavy lifting in that revolution. They were colorful extras fighting little local battles, but the real execution was done by French, British and Canadian aircraft operating under NATO command that bombed Gaddafi’s troops almost to extinction in a six-month campaign in 2011. The militias’ main role was to put a Libyan face on the whole operation, but when NATO walked away after Gaddafi was killed, they were left in charge. They split repeatedly as their quarrels over local extortion rights became acute, but they are united in resisting the re-establishment of central control by a national government. It is not in their interest. There is, however, a basic division between eastern Libya (Cyrenaica) and western Libya (Tripolitania) that underlies the manifold rivalries of tribes and clans in both parts of the country. It’s a division that goes all the way back to Roman times, when the east spoke Greek (the language of the eastern part of the empire) and the west spoke Latin. Haftar controls Cyrenaica and the vast and largely unpopulated desert south of Libya, where most of the oil is, but the west has the advantage of numbers and a profound dislike of being ruled by the east. That’s why the western militias are coming together now, and why his offensive against Tripoli is at least temporarily stalled. As for the rights and wrongs of the situation, there’s plenty of blame on both sides. 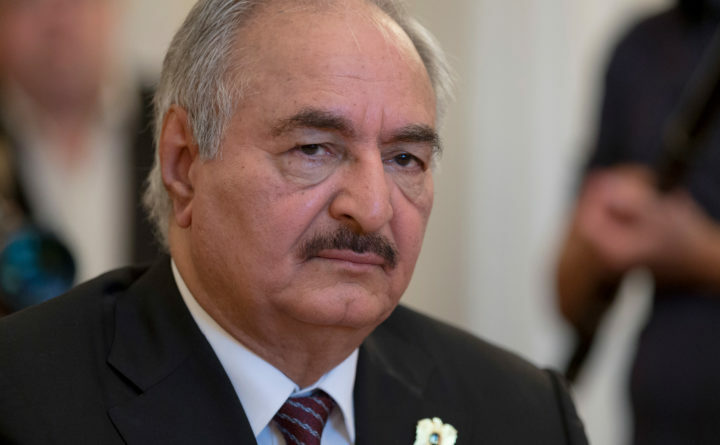 Haftar ostensibly represents the parliament elected in 2014, which fled to the east later that year when Islamist militias seized control of Tripoli. It now sits in Tobruk in the east and is entirely under Haftar’s thumb. This is Haftar’s only plausible claim to legitimacy. Once a colleague of Gaddafi’s, he fled the country, ended up in exile in the United States for 15 years, and is an American citizen, but he returned to Libya in 2014 and gradually united the militias of the east under his command as the Libyan National Army. He cleared the Islamist extremists out of Benghazi, the big city in Cyrenaica, in a bloody two-year war, and then set out to take the rest of the country. His troops reached the outskirts of Tripoli early this month. The “internationally recognized,” United Nations-backed Government of National Accord inside the city is equally unconvincing as a national savior. It was not elected, but cobbled together by U.N. mediators in 2015. Its leader, “Prime Minister” Fayez al-Sarraj, didn’t even arrive in Tripoli from abroad until 2016, and he has struggled to establish his authority over the city, let alone over the militias or the entire country. So now Haftar is making his big bid for power, and Serraj is practically irrelevant. The various militias of Tripolitania that are coming together to resist him undoubtedly outnumber him, but they have no joint command structure and Serraj cannot provide one. The smart money says Haftar is bound to lose, but that remains to be seen. He has both Egyptian and Russian support, although it’s unlikely that either of them authorized this adventure. And ordinary Libyans face a choice between a new 75-year-old dictator and continuing chaos, poverty and intermittent low-level violence as the militias squabble over the spoils. Not that they will actually be asked about the choice, of course.